I am David Griswold, a math teacher in the upper school at the Harpeth Hall school in Nashville, TN. It is an all-girls independent school, and a magical place. 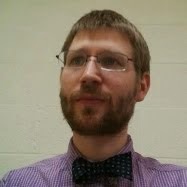 I teach AP statistics and geometry, along with a 1-semester elective Intro to Computer Science. I taught physical science in the middle school here at Harpeth Hall from 2011-2014, and before that taught in NYC schools both public and private for five years. Our school is very technological, as is common these days. We use tablet PCs with Windows 10, and I make extensive use of many software tools but especially Microsoft OneNote for quick and easy distribution of documents, assignments, etc. In 2016, I was lucky enough to join the writing team for the CPM Statistics textbook, a statistics textbook with a unique style. I am extremely proud of it (and got the best AP scores of my teaching career the first year I used it; we’ll see how the future goes). I have collected and will continue to collect some unofficial resources for the text here.